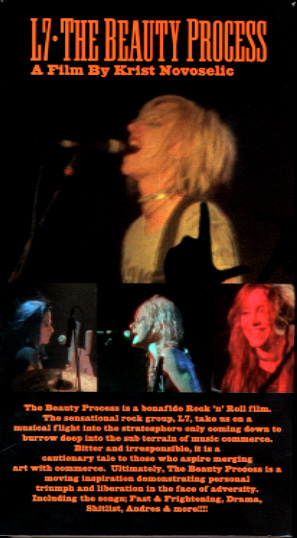 This film is a 43-minute colour film that relies mainly on L7 performance footage, although the band does engage in some acting. There are three satirical vignettes exposing the music industry's foibles: a focus group, lunch meeting with a record company artists and repertoire executive and a graduation ceremony/contract signing with the devil. The theme of this movie is art versus commerce. This epic, age-old battle is fought on many fronts. The idea fascinated Krist some much that it became the theme of the film. Shot entirely in grainy 8mm film during a L7 Tour with Sweet 75 in October 1997, this film debuted at the Blinding Light Cinema, in Vancouver, B.C. on May 20, 1999. "The focus group is about marketing, the A&R guy is about how you're promised the world and you have a little bit of bad luck and they drop you, they abandon you, they leave you holding the cheque," Novoselic explained. "The commencement is about being frustrated and how to let those frustrations go."